Coyote Moon can offer a variety of beautiful structures to suit the needs of your event - be it a festival, fayre, party, wedding... Each space can be carpeted, furnished, decorated and illuminated on request. We can equip and run the space as a cafe, music/performance venue or cinema - please see our venue page for more details. The centre-piece of Coyote Moon is the 9 metre wood and canvas geodesic dome with the option of a porch entrance. We have one 5.6 meter and two 5 metre yurts which can be hired independently or along side the dome to which they can be elegantly attached to form cafe/bar and back-stage spaces. 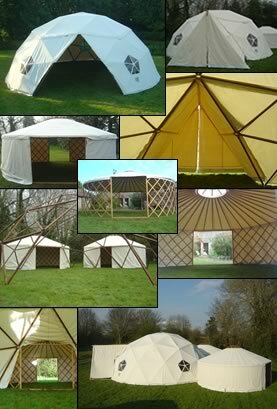 We can provide a yurt sauna which can be connected up to the rest of the structure - with a screened off changing room yurt in between.